Public Universities: What's in a Name? When you’re considering higher education, how do you decide which schools to omit and which schools to examine more closely? With so many factors to consider, it’s a monumental task to even decide on a filter that will help you to narrow down the list of colleges and universities. One of the main filters used is name recognition: have you ever heard of the school before, and, if you have, what do you know about it? In my experience working at Clemson University, a public school without a traditional public school name, people tend to make assumptions about a school based on whether its name sounds like a public or private school. So, how do you know if a school is public or private? Are your assumptions about a school based on whether it has “state” or “tech” as part of its name? Better yet, what are the assumptions you make based on a school’s name? Enough with the questions. What I’m getting at here is the name of a university or college can either encourage a student to pass on by without a glance or run at full speed to speak with the college’s representative at a college fair. Public schools can often be overlooked by students and parents because their names create assumptions that aren’t true—by a long shot. Maybe students feel like attending a state or tech school isn’t for them because, well, it’s generic. And who wants to be generic? 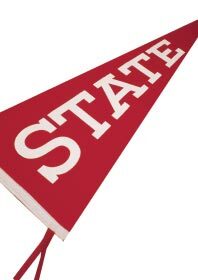 Perhaps students and their parents automatically associate “state” with large lecture halls and students who fall through the cracks and “tech” with great athletics but average academics. But there’s more behind the names than students and parents may realize. Let’s look past the colleges’ names for a moment and look at what the schools are about. You’ll find that public colleges and the students who attend them are anything but generic. We’ll start with size of the campus itself. An assumption about public colleges and universities is that they’re all big—big classes, big campuses, and big football stadiums. Yes, some are big. For example, Arizona State University had over 68,000 students enrolled in fall 2009. But a big school isn’t a negative on its own. Think about it: if you love meeting new people and making connections, a larger school might be just the thing for you. However, not all public schools have large enrollments. For instance, the College of William and Mary has an enrollment of about 6,000 (and it’s a Division I school, so you don’t have to give up top-notch athletics to attend a smaller school). Perhaps you think that a public college or university just isn’t going to give you the rigorous academics you’re looking for. Before you brush off a college because you think it isn’t challenging enough, take a second to look at the stats. Yes, look at the average SAT and ACT scores and the average GPA or class rank of the school’s incoming freshman class, but also take a look to see if the school has an honors program and what the average test scores and GPAs are for the program. Honors programs at public schools are amazing resources that can offer students smaller classes, extra research opportunities, and a host of other perks. If you don’t like public schools because you think their admission policies are all about the numbers, consider applying for the honors program. Honors programs usually look beyond test scores and GPA and focus more on a student’s recommendation letters and essay to determine who is eligible for membership. It’s important to remember that every school is different, so be sure to ask if an invitation to join the honors program is automatically considered or if a student must submit an additional application. Money. (Or “cost of attendance,” but “money” is much more attention-grabbing term, isn’t it?) No matter how you look at it, college is expensive. Yet, it’s also an investment, and the goal is to get your education to pay you back in the long run. “Return on investment” is a popular buzz phrase in college admission, but what exactly does that mean? SmartMoney took a look at public schools, non-Ivy private schools, and Ivy League schools to see which students are getting the greatest payback in terms of money spent in tuition versus annual salary. Guess who won? Public schools! SmartMoney looked at 50 schools to see how their graduates are faring when it comes to their educational investment. The top 17 schools are all public. SmartMoney even used the cost for out-of-state students when considering the public schools to conduct this research, showing public schools are good investments for both in- and out-of-state students. No matter how you slice it, college isn’t cheap, so think about what you want to get out of your education, and if it’s preparation for a job that, proportional to your tuition, pays well, you’ll probably want to seriously consider a public school. So, now you know that public schools come in a variety of shapes and sizes, they offer extra academic challenges, and they are a smart use of your tuition dollars, but is a public school going to let you be an individual? A lot of students are worried about falling through the cracks. There’s a difference between fitting in and disappearing, and a major assumption about public schools is that students who attend them are going to disappear—in large lecture halls and in the job market. Here, again, is where it is important to look beyond the name of the school. Look at the average student-faculty ratio and the percentage of students who have jobs or are in graduate school within six months to a year of graduation. These numbers, more than just rankings or average test scores, will tell you what your classroom experience will be like and if the college is graduating students who are successful in the job market. A college education isn’t always about the numbers; it’s also about the overall experience that a student is looking for. A major advantage of public schools is they generally have larger enrollments, which means they also have more student clubs and organizations that represent their diverse student bodies. Rather than assuming a public college or university is generic because it has to fit all of its enrolled students, think of it as a place with a varied geographic and ethnic population. And, as a result of this population, the schools’ activities and organizations will be quite varied, giving students the opportunity to seek out new experiences in the schools’ extracurricular offerings. As mentioned before, public schools don’t always have huge lecture hall classes. For instance, the University of California, Berkeley has around 26,000 enrolled students, but its student-faculty ratio is 17:1, so a public school that has a larger enrollment doesn’t always have larger classes. If the school has a smaller student-faculty ratio, it probably means that you’ll be in classes with fewer students, and you and your professor will likely have the opportunity to get to know each other, which can be helpful for things like help outside of the classroom and recommendation letters. Public colleges and universities often also offer high-caliber research opportunities, but, as the example above shows, this is not at the expense of teaching its undergraduates. Finally, perhaps one of the most well-known stereotypes of public schools is that the popularity of sports on campus outweighs the popularity of academics on campus. For students looking for an academically rigorous college experience, a school that is known for sports won’t make it on their list because they think that strong sports and strong academics can’t coexist. Again, looking past assumptions like these to see what a school actually has to offer can keep you from passing up on a well-rounded college experience. It’s true—public colleges and universities can be good at both academics and sports, so while you’re in class, researching, publishing, and participating in academic competitions and conferences, you can also take a break and enjoy some of the social aspects of being a college student, like cheering on your team. Athletics doesn’t have to compete with academics. Rather, athletics can enhance a student’s academic experience because it gives them a chance to shift focus for a few hours. Athletics also allows an entire college family to come together, giving students the opportunity to see that they’re part of something bigger than themselves (even providing some great networking opportunities). So, is public school for you? Whether you’re just starting your college search or you already have your short list, look past the assumptions that you or your friends and family have about a school. Remember that public schools can be academically challenging, have diverse student bodies, and be wonderfully fulfilling social outlets. They can also have access to state resources that can broaden a student’s educational opportunities. The bottom line is that public colleges and universities are not limited to stereotypes and assumptions and are worth taking the time to get to know. By Claudia Moore O'Brien, M.Ed.